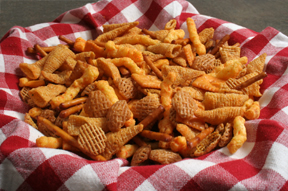 There's sure to be something for everyone in this snack mix. 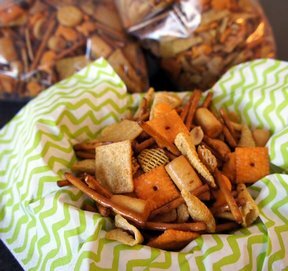 From cheesy crackers to cheese filled crackers, this seasoned up mix will please everyone. This makes a HUGE batch, too. Mix together popcorn oil, onion and garlic powders. Put the rest of the ingredients into a large garbage bag and pour the seasoned oil on top. Close the bag tightly, but leave space for mixing. Mix gently for 1-2 minutes. 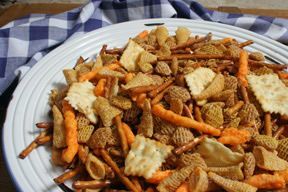 **NOTE: Try different snack crackers or mixed nuts. 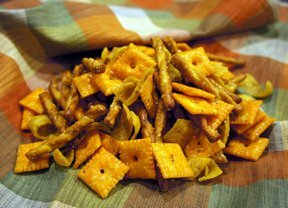 You can use different boxes of snacks and the mix is still very well seasoned.